WEEK END EXPERIENCE IN CRETE!!!!! 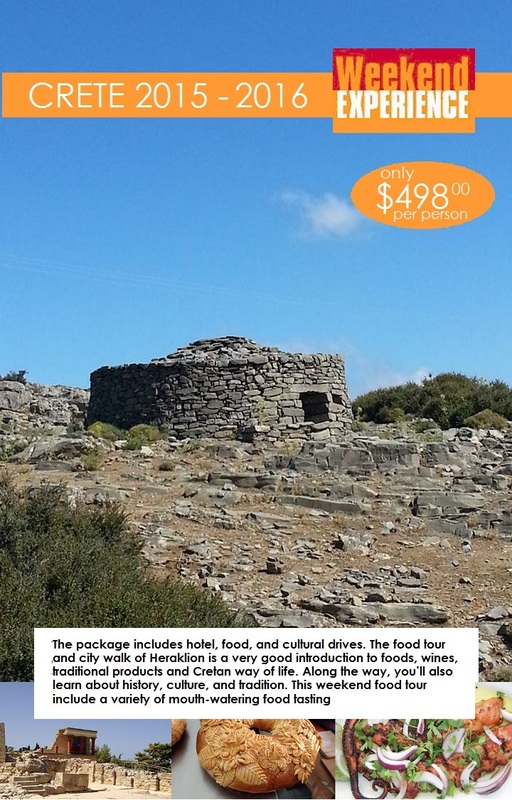 As Crete boasts of the unique culture and cuisine and Cretans knows that they have the finest gastronomical, tasty and healthy solutions proved and signed by the medicalscience society (Cretan Traditional Mediterranean Cuisine and Nutrition), this weekend food and wandering break is an excellent way of experiencing the all the aspects in one + one exciting day out. We end our walk after lunch visiting and taste the famous “loukoumades” (Cretan style doughnuts sprinkled with honey and sesame) there are just amazing. When you put them in your mouth they are just a fried little ball, but when you bit them the honey come flooding out over your tongue. Lastly a visit to the best small pastry shop in the city. Gloria:Artistic feeling + imagination + pure fresh ingredients = fascinating the palate in taste and quality elevating your senses to heaven: We taste the: Galatoboureko: custard cream and filo pastry in syrup and: trigono:: cheese cream and filo pastry in syrup. Incredible taste never have taste anything like that!! Drive you to the hotel and leave you relax taking a nap and get ready for the dinner. We start our day visiting the most important archaeological site on Crete, the Minoan palace of Knossos, the mythical Labyrinth. Concentrating on the prehistoric era of the island, revealing its unique historic course and penetrating into its ancient prehistoric cult, arts and ritual practices, we will be visiting an amazing area of 22. 000sq meters. The visit takes an hour and a half. Ending the visit our tour will continue driving west about 30' min drive from Knossos to the little kafeneion of DOXA to visit the place of a bee keeper and learn about traditional methods of bee-keeping employed here to make organic, additive free local honey. 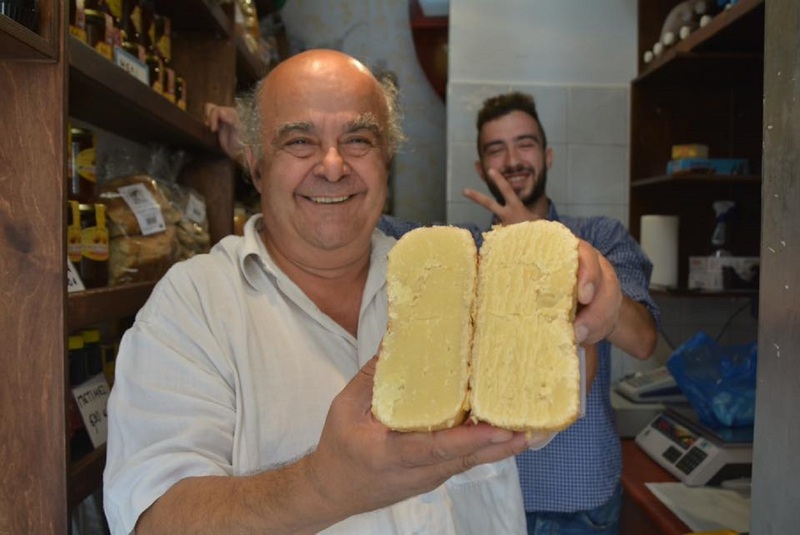 The owners are two brothers who have been bee-keepers their whole lives, inheriting the business from their father. At the cafe, you will have the opportunity to take honeycombs straight from the beehive, learn about the bees and beekeeping as well as having the local pancakes known as tiganites served with honey and cheese pies along with raki or mountain herbal tea. Next stop the near village of Marathos to visit the women’s co-operative work shop where the residents make unique and incredibly artistic pastry breads called Xompliasto. Keep driving west in the mountains and we're off to lunch at the finest restaurant on the island at Drossia. The restaurant is family owned; they also own the entire valley around it. At this delightful restaurant, they serve only what they grow themselves. This is a most authentic experience of real Cretan hospitality. A visit to the forgotten monastery of Halepa before we drive back to Heraklion airport / port where our wek end ends. Thank you for being here.